THE Rudd government could walk away from a key education target to increase university participation, with Higher Education Minister Kim Carr saying rapid growth in enrolments over the past three years had potentially compromised the quality of degrees on offer. Senator Carr, who was yesterday returned to the federal ministry, indicated the government was prepared to dump its quest to have 40 per cent of young people with at least a bachelor’s degree by 2025. While a reversal in policy, the move would stem budgetary pressures to fund hundreds of thousands of new places by putting caps back on how many students universities could enrol. This would be a good idea, at least as an interim measure before wide-ranging reform of higher education funding. Un-capping student enrolments at universities was always highly risky for the Commonwealth, given it picks up a high proportion of the costs of higher education, with students paying only part of the costs through the HECS-HELP loans scheme (see Andrew Norton’s excellent Graduate Winners publication, particularly p. 16, for an overview of higher education funding). Hence, to limit the Commonwealth’s exposure, it makes sense to cap the number of places the Commonwealth subsidises. But this would only be an interim measure, as the higher education system requires signficant reform to wean it off Commonwealth support over the longer-term. 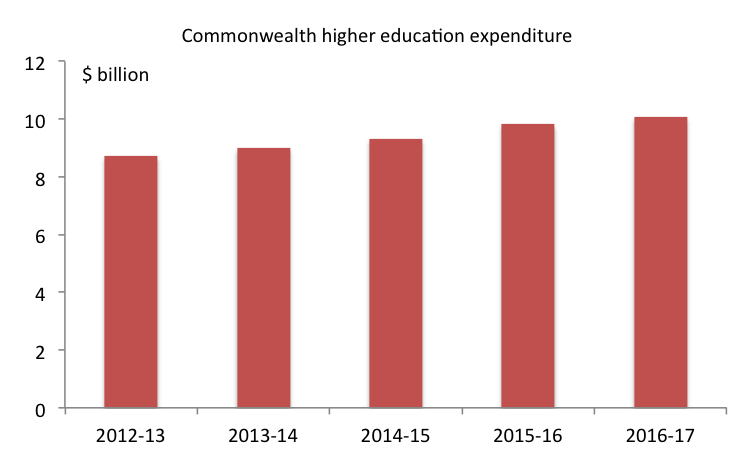 As Andrew Norton observed in his Graduate Winners report for the Grattan Institute, many graduates do very well out of their university studies, and a case can be made for reducing Commonwealth subsidies and having students contribute a larger amount through HECS-HELP. Further, in my opinion, the Commonwealth should consider re-introducing full-fee undergraduate places for domestic students. I don’t expect the current Government will go this far, but I hope future Governments will consider these measures. Potentially billions of dollars can be saved from the higher education budget, and there is no shortage of worthwhile projects in other areas. As an example, consider the much needed second range crossing to Toowoomba, which would cost up to $2 billion. With an accident occurring on the existing range crossing nearly every week, and one just on the weekend (Truck crash shuts down the Toowoomba Range), it may be time to invest in this important project. This entry was posted in Education, Toowoomba, Transport and tagged australia, commonwealth, grattan, hecshelp, highered, highereducation, rangecrossing, toowoomba, universities. Bookmark the permalink.